The background. Just about the only thing the two sides agree on is that this case is about more than cake, the AP reports. 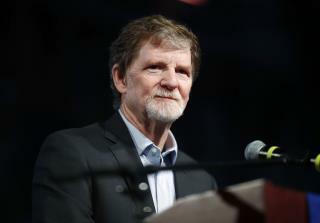 LGBT activists say that victory for Phillips, who refused the cake request from Charlie Craig and Dave Mullins, would open the door to widespread discrimination. Phillips, who has the support of the Trump administration, argues that he is an artist, and artists should be free to choose what they will create and what they won't "without fear of being unjustly punished by the government." It is very encouraging that the baker's lawyers have opted to totally ignore the actual argument of the baker and replace it with a total loser argument of free speech. This is really good news for people who care about liberty. The lawyers know that the religious freedom argument will definitely lose. Unfortunately for them, the best they could come up with is to argue that a cake is speech. If a cake is speech, then nearly everything in the world is speech. All food prep is speech? Architecture, cabinetry, and hair styles are speech? That glaring problem with their argument will be its death. Writing a message would be speech. Bakers should not be forced to write a message on a cake. The cake itself is not speech. The cake is an item for sale no matter how customized it is. Anyway, I was just glad to see that the baker's lawyers were this desperate. I can't imagine that they will win with this awful argument. Curious whether Gorsuch is on board. Interesting that this Plan B argument is not at all conservative. It would radically alter the law by sanctioning discrimination over all manner of businesses. Are conservatives angry that they are using this terrible strategy? It feels like they are abandoning all of the people who have so terribly argued for a religious freedom to discriminate. Any conservatives feel abandoned? The Supreme Court unanimously sustained an Appellate ruling in the sixties, denying a person's claimed religious belief that racial mixing was wrong, so should be allowed to effectively discriminate in public transactions. This case has been conveniently warped by the baker's legal team, sensing the weak case, from that of religious freedom, to one of 'free speech'. Problem is, whatever message is perceived by a baker's cake is not likely to translate to "gee, this baker is endorsing gay marriage," but more likely "gee, what a nice/ ugly/tasty/awful cake." Claiming other bakers were around to fill the order, is repeating the Jim Crow logic, "those colored folks got their own places." Legitimate newspapers frequently print advertising and editorial content not in line with the paper's philosophy, and to deny the right to express other views does rise to infringement. But the baker is free, to attend his church, express his views, elsewhere. He is not free to deny service to those he does not agree with. They asked for no abnormal or offensive designs. Allowing his case to prevail effectively allows anyone to suffer discrimination, excused as religious freedom. If he wins, I will be sure to refuse service to all rightwing bigots. I think about how many communities with religious diversity used to actually alternate working for one another during each's various religious holidays, making gestures of good will and true spiritual teachings. Now, religious groups align with suppression, oppression, denial of rights even though our country was founded on the separation of church and state (every European nation had state churches which led many to escape persecution by migrating, to this country). Of course the Right has denied history as well as science, to our peril. Short answer: Your rights do not allow you to infringe upon the rights of others.